The release of Mac OS X 10.6 (Snow Leopard) has rendered Affrus 1.0 unusable. Over the last few years I’ve done little with the Affrus Perl debugger and I get regular queries about what is happening with the product. After several attempts to make Affrus 1.0 work on later Snow Leopard, I gave up. 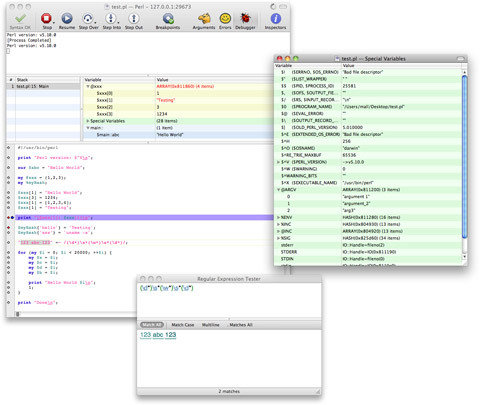 Affrus 1 was built using CodeWarrior and Carbon and the transition to Xcode and modern versions of Carbon proved too difficult. However, I can report that over the last few months, work has resumed on Affrus 2.0 which is a re-implementation of Affrus using Xcode and Cocoa. I am being deliberately circumspect about describing the product’s features and system requirements to avoid breaking any promises when the product is finally released. I am not yet at a point where I feel comfortable inviting Beta testers to use the product, but it won’t been too much longer. Thank you very much for the update, Mark. That’s wonderful news! I’m looking forward to using the new version. Thanks for your work on this project. I also am looking forward to the new version. This is exciting news. If possible please support 10.5 for PPC. I’m so happy to hear this! Thank you, thank you!! THANK YOU!!!!! This news makes my day. I would love to go back to Affrus! I can barely wait. I would even use a version that didn’t have all the features that version 1 had. Would love to see other languages added such as Ruby or Python. Gooooooood news!! I have missed Affrus since I moved to 10.6. Im looking forward to start doing some emnice/em Perl development again. Great news!! Would love to have this running on Snow Leopard. For what I do, the current version functions on Leopard.